On April 1st, a party of boys left Victoria for Switzerland. Our destination was Melchsee Frutt, a small skiing centre near Lucerne; we were accompanied by Messrs. Perry and Cotes. The fun started before we reached Victoria when a small group was mislaid on the Underground and spent some anxious moments at Royal Oak. When we were reunited at Victoria we joined up with a smaller party of boys from Bedford Modern School. The journey was long and tedious (16 hours); alas for Mr. Perry’s record: one member was sick on the boat! On our first day we learnt how to stand, walk and execute a straight turn, and in the afternoon we went on a ski-trek designed to practise us in these arts; during this first afternoon’s walk Green broke his ankle. On the second day we broke into two parties for instruction, half with a Swiss instructor and half with a British Ski Club representative. This latter half also changed to a Swiss instructor later. Our mornings were usually spent in instruction; we learnt stems, stem-turns, snowploughs, traverses, and kick turns until we thought we were brilliant. Unfortunately we were mistaken. The afternoons we occupied in a more ambitious fashion. 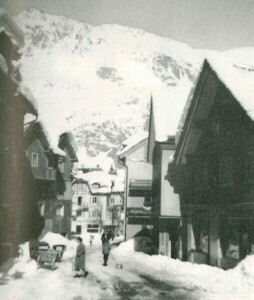 Some would be taken up on the ski-lift, while others would enjoy a swift run down the valley to Stockalp. Falls on these occasions were numerous but not dangerous; we all learnt very quickly how to fall safely and painlessly if only because for many it was the only sure way of stopping. The journey down to Stockalp was a magnificent run. Right down the steep valley, underneath the cable-car, the track threaded through pines between two shoulders of the mountains. There were traverse corners on bare, steep slopes at first. Then the piste entered the pines, and you dashed round hairpin bends a foot from drops of fifty five feet or more. If the piste were good even we beginners could reach speeds of 35 m.p.h. while the experts whistled past at a remarkable rate. In parts, too, the track lay over sharp undulations which at speed induced a feeling of reckless, if unstable, joie de vivre. We were not quite so lucky with the weather. At first it was fine, but not sunny. On the Friday it began to snow lightly, and increased in severity during the night, after which it snowed continuously for the next five days. It was not heavy enough to keep us indoors, but it was vaguely unpleasant. Just before we left, the sun came out and the sky became a brilliant blue to give us a glimpse of what it might have been. On the last Friday we took the Swiss Bronze medal test and all passed. Two boys, Green and MacDonald, broke ankles; to them and Sedgwick whose knee nearly disintegrated we extend our sympathy. Everyone has now recovered, except, perhaps, Mr. Perry who may never recover from the strain of contending with over twenty boys and a Travel Agency at the same time. He knows how grateful we are to him for making it all possible. Ending on a note of levity, we congratulate Brock who not content with leaping into an abysmal crevasse later charged a tree and neatly cleft his ski in twain. The route down the valley to Stockalp was along the road that was used as a ski run in winter and a bus route in summer. It was a twisty mountain road and the first trip down was quite frightening, each time you approached a bend at speed wondering whether you would be able to navigate the turn or to try and stop and change direction to start again. Future trips became faster and more exhilarating. It was at the bottom of run that I met up with the tree against which I broke my ski. I was trying to avoiding some pedestrians who were standing in the road. Funnily enough I only just got rid of the piece of ski when we moved house last month.